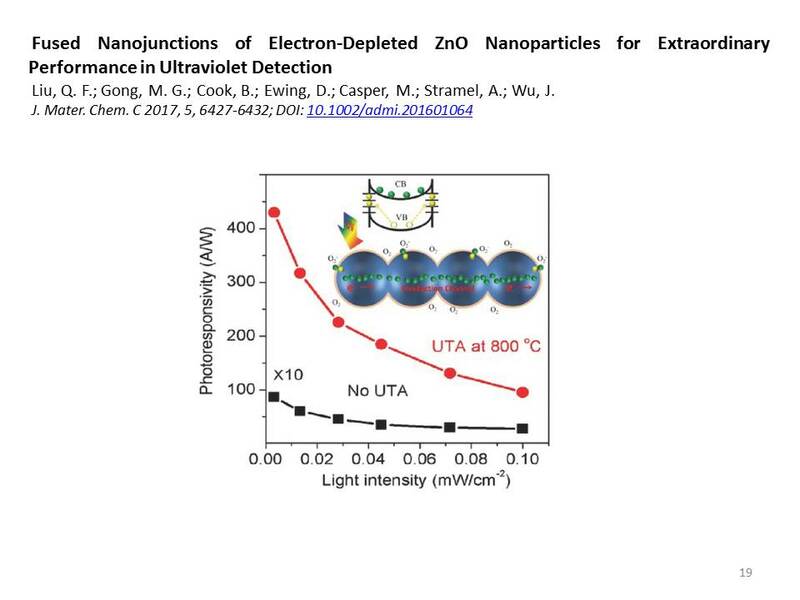 Zinc oxide nanoparticles (ZnO-NPs) with radius of the Debye length have the optimal electron depletion effect for high-performance optoelectronic devices. However, a major challenge remains in assembling ZnO-NPs into 3D interlinked networks for high-efficiency electron transport. Here an ultrafast thermal annealing process has been developed by exposing the ZnO-NPs to excessive heat for a short period of 2 s. This enables the formation of NP-NP interface nanojunctions, resulting in nearly two orders of magnitude decrease of the dark current I-Dark and more than an order of magnitude increase of the photocurrent I-Ph under ultraviolet (UV) illumination. Moreover, the UV photodetectors based on such 3D interlinked ZnO-NP networks exhibit extraordinary performance with high I-Ph/I-Dark ratio of 3.1 x 10(5), responsivity of up to 95.4 A W-1 at 340 nm UV power of 0.1 mW cm(-2) (and up to 430 A W-1 at 0.003 mW cm(-2)), detectivity of 1.4 x 10(13) Jones, and rise/decay time of 9.4 s/13.5 s. These results illustrate the critical importance of the NP-NP interface nanojunctions and provide a low-cost pathway for high-performance ZnO-NP optoelectronics.